Gear: A simple cast-iron pan is key. It sustains a high, even heat that translates to a nice, deep caramelization and no need to finish in the oven. Short metal tongs are best for handling a big piece of meat. Turn the meat to sear every side (fat edges included). Yeah, poking the meat is cool, but a simple cook’s instant-read thermometer is the most reliable way to know when you hit the 130° medium-rare sweet spot. The meat: We’ve got love for all kinds of cuts, but we agree that he rib eye is the best, and our all-time favorite. 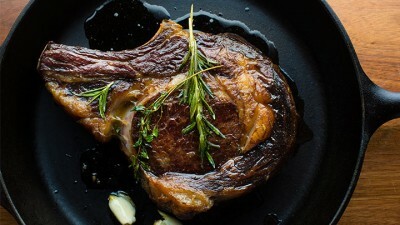 Rib eyes have the highest marbled fat ratio. They just taste better. Salt early, salt often: Salt is a steak lover’s best friend. The meat needs way more salt than you think it does. Under-salting results in tasteless meat–even if you’ve splurged on the best quality–so really go for it. Here’s the rub: Rosemary, thyme, lemon peel and garlic supply a subtle fragrance and flavor. Oil, but not much: Put the oil on the steak, not the pan. You’re searing, not frying. Butter: We like to baste the meat with foaming brown butter (quickly infused with rosemary, thyme and garlic) as it cooks because it perfumes the meat and adds another layer of flavor. A very sharp knife: Don’t underestimate its importance. After all the care you’ve put into cooking the perfect steak, you want even pieces–cut against the grain–that do your work justice. 1. Pat the steak dry with a paper towel to remove any excess moisture, then season generously with salt. Remove the leaves from 1 sprig of the rosemary and add to a small bowl along with the lemon, 4 sprigs of the thyme and 4 cloves of the garlic; mix to combine. Using your hands, rub the steak with the lemon-herb mixture. Wrap the steak in plastic wrap and refrigerate for at least 4 hours but preferably overnight. 2. Remove the steak from the refrigerator and allow to come to room temperature, about 1 hour. Remove and discard the rosemary, thyme, lemon and garlic. Rub the steak with the olive oil. 3. Heat a large cast-iron skillet over medium-high heat until very hot. Add the steak and cook until the bottom is crusty, about 4 minutes. Using tongs, hold the steak up on its sides, turning occasionally, to sear its edges, about 5 minutes. Flip the steak. Add the butter to the skillet along with the remaining rosemary, thyme and garlic. Using a large spoon, baste the steak with the herb butter until medium-rare, or until an instant-read thermometer inserted into its center reaches 130°, about 5 minutes more. 4. Transfer steak to a cutting board and allow to rest for 10 minutes. Cut the steak off the bone and slice the steak, against the grain, into thin slices. Garnish with fleur de sel. Serve immediately.